Having crafted and refined your mix, join the growing number of professionals who've chosen the Oxford Limiter v3 to deliver maximum loudness, density and presence - whilst retaining the kind of clarity and transient detail that conventional brick-wall limiting can't. 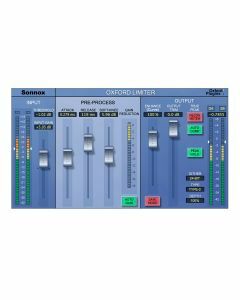 Whether you're after the Oxford Limiter's hallmark transparency or heavier creative effects, its advanced look-ahead processing and unique Enhance function provide the sample-value limiting and musical boost needed to reliably avoid clipping and confidently increase apparent loudness. Comprehensive metering is included, which displays not only conventional peak sample value, but additionally allows the user to monitor the true validity of the programme in order to avoid the generation of damaging reconstruction overloads in the target equipment, which are often invisible during production (sometimes termed 'inter sample peaks'). A further function allows the user to dynamically correct for reconstruction overloads in real time, thereby achieving maximum possible modulation levels without the risks of producing 'illegal' signals often associated with compression and limiting. Rather than releasing a vast number of Plug-Ins Sonnox instead concentrated on doing a few things really well. Staple, everyday tools that any engineer can reach for with confidence, sure in the knowledge that using each one's intuitive GUI will result in quick, confident and great sounding mix decisions.